Silly me. 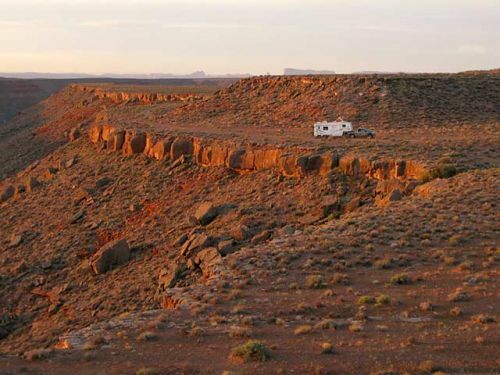 At one time we thought that three hundred and sixty five days would be enough time to RV across America and hit all of the “best” sites this country has to offer. In a cross-country roundabout from California to Maine, Florida and back, my husband and I foolishly believed that a year on the road would get the travel bug out of our systems and put us right back where we started, into the rat race of a conventional life. Next year will be our seventh year on the road as a full-timing traveling family of two adults and a dog. When we started our “one year” journey, it was a given that eventually we grow weary of non-stop travel. After all we had already met many full-timing couples who gave it up after a year or so. But when it came to our own adventure, something clicked at about the fourth month into our cross-country jaunt; we knew there was no way we would be happy calling our road trip done and reverting back to our old lifestyle. So we kept going – by being frugal, keeping free-flowing communication between us and finding ways to earn a living no matter where we parked our home. As another year winds to a close we are still in awe of how free of a life we enjoy compared to most people we know, and we’re still happy to preach the full-timing gospel to anyone who wants to know more.
? We made boondocking easier: instead of hoisting five gallon jugs of water to pour them into our freshwater tank with a funnel, Jim added a bypass that utilizes our water pump to easily siphon water from the jugs directly into the system.
? Always monitor your propane levels so you don’t run out at inconvenient places or times.
? Staying accountable for our health and fitness goes a long way toward safe, comfortable driving.
? We realized that we can’t do it all, like running our Internet businesses while workamping 50 hours a week and trying to enjoy ourselves. Doing so is a fast-track to the insane asylum.
? Connecting with full-timing friends in person is better for your morale and happiness than any Facebook encounter. Sometimes it seems like our full-timing life is always a party but it really isn’t. Living by the seat of your pants doesn’t always come easy when you’re a long way off from the pension years. We forgo a lot of unnecessary gizmos because of our tight budget. Our income is way below that of our suburban, career-driven peers and sometimes it’s hard not to be envious of their earnings. But as I sit here writing to you from a beautiful, free and isolated boondocking spot in the middle of a beautiful desert with only the coyotes for company, we know that joy we feel from our courage to live this lifestyle now, before a “someday” that may never come, is well worth the trade off.